When you login in Windows 8 you see the new start screen and from there you usually press WIN + D (usually I do this always after log in) as a Shortcut to Desktop or Press Desktop Tile on the Screen. Now this is a hassle from many users so I started to look for solutions but, I saw many different types of solutions, some worked and some didn't, while ones working came with side effects as slowing down the startup or other things. After a while searching, I found Skip Metro Suit, it is a small utility that allows you disable specific features of Metro UI, you just have to select what you want to disable and its done. 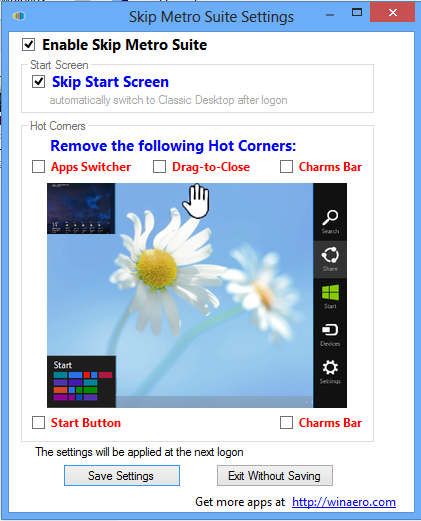 After enabling it, I restarted the computer and after login, I saw Start Screen (Metro UI) for a Second or you can say it was just a flicker and then I was skip to desktop in Windows 8. I was happy with results because their were no negative impacts and it did what it had in the most efficient way. well there are also other methods were we use batch files and Task Scheduler but all those have big performance issue so that is the main reason, I Selected Skip Metro Suit. I hope you have found your desired solution to How to Skip to Desktop in Windows 8 and do comment below if you have problems or have found something interesting related to it.